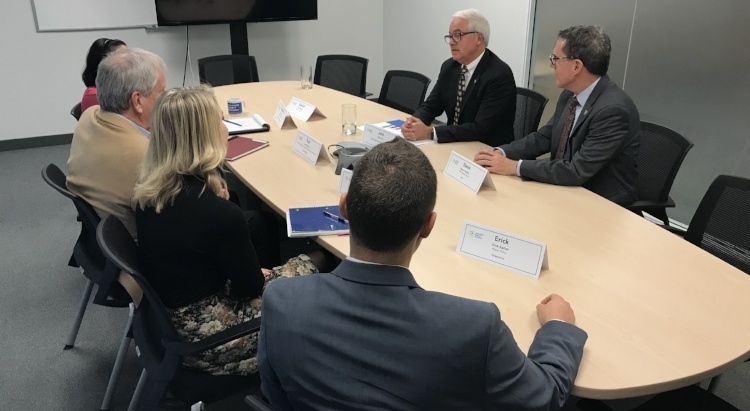 Cox, a businessman and attorney, was very interested in hearing about the growth in the advanced energy sector and reiterated his desire to grow all parts of the economy, including the advanced energy industry. He highlighted the need to reduce the cost of doing business in California and eliminate burdensome regulation. When asked about the state’s existing rules and regulations impacting the state’s energy sector, Cox voiced support for an “all of the above” energy policy and the need to review and better understand the costs and benefits associated with the state’s climate and energy implementation plans. Cox also spent substantial time discussing his vision for a “Neighborhood Legislature.” Cox is spearheading an initiative for the 2018 ballot that would shrink districts to the size of neighborhoods. Cox believes this will transform the Legislature into a body that is more representative of local communities. He believes eliminating the power of special interests will make the Legislature more independent and focused on addressing the issues that most impact Californians. The Neighborhood Legislature is central to his platform and seemed to be his chief strategy for getting things done in Sacramento. AEE Institute is looking to host roundtables with the remaining candidates in early 2018 to complete the non-partisan speaker series. AEE Institute plans similar efforts in other states that are holding gubernatorial elections next year.